A natural born winner (of the Cannabis Cup in 2000 that is) Blueberry Regular by DJ Short is anything but regular. Incredibly fruity to the taste and will make your nostrils flair from it's floral scent, this Indica strain is one to savour. Blueberry from DJ Short is the ORIGINAL Blueberry! Predominantly Indica at heart (80% Indica/20% Sativa) Blueberry regular from DJ Short is a strain of high quality. 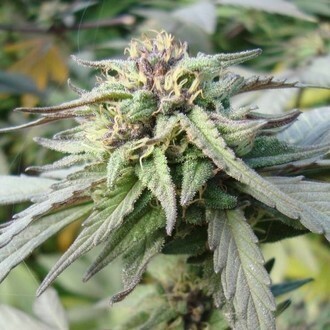 Steeped in a history that dates all the way back to the late 1970 it's likely some smoker may get a whiff of nostalgia to accompany the plant's sweet blueberry aroma. Under the right condition Blueberry is known to be an abundant producer of dense buds red, purple and blue in appearance. Its beautiful looks are matched only by its enthralling scent and pleasant high. It's no wonder Blueberry was the winner of the 2000 High Times Cannabis Cup. Characteristically, Blueberry stay true to its Indica genetics. Medium in height it develops long branches packed with sticky trichome-laden buds which sport large calyxes. This incredibly fruity number packs a equally potent punch that is both long lasting and enjoyable. If we delve a little deeper, the experience becomes somewhat cerebral teetering on euphoric. Resistant to tolerance build-up Blueberry is the bud that just keeps on giving - most definitely a good thing. Its exceedingly quick flowering speed of 7-8 weeks come as an added bonus to novice and veteran growers alike.